As we near the holidays, it may seem too late to get rid of your old furniture or mattress until the new year. However, decluttering your home for the holidays can set the stage for welcoming in the new year. I mean, what’s better than ushering in the new year in a clean, tidy living space? By decluttering, we don’t mean just removing your old junk, we also mean spending time considering how you can start the new year off on the right foot. 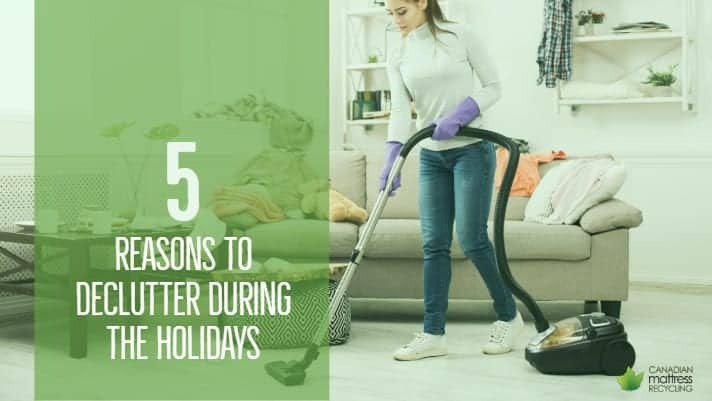 Cleaning and decluttering throughout the year, even during the holidays, can help lessen your workload when the new year rolls around. 1. You may find old items that you can dust off and give as a new gift or donate to an organization that may have a use for them. If these items are in good or decent condition, for example like throw blankets, socks, pyjamas, and mittens, you may be able to find a new home for them. Consider looking at making a donation to your local Big Brothers chapters, Salvation Army, or even charities that are looking for these items. The holidays are when most people donate goods and nonperishables, but there will always be a need for specific items in the new year. No donation is too small, and every contribution helps. In Canada, when temperatures drop during the winter, be on the look out for charities and local groups seeking donations for items like mittens, socks, and blankets. There may be companies or local businesses running drives, and you could find a new home for your old items easily. Large items like furniture and mattresses may be more difficult to donate, but the parts can be easily recycled by a local facility to be used in new products that can help these organizations. Cushions, fabric, and foam, can all be deconstructed from couches and beds, and be repurposed for use by those in need. 2. Making a big decision for your home next year? If you’re considering to downsize, or even to replace an old piece of furniture, consider having the discussion when family members are less preoccupied with work. As the work year winds down, people are taking vacations or staying home to spend time with their families. This may be the perfect time to strike a conversation with your parents, or family living with you, asking will happen to that squeaky old couch! Perhaps replacing that old couch has been on your family’s mind, but due to the stress from work, school, or life, they may have forgotten about it. Asking them at a time when they’re relaxing can lead to productive discussions about home improvements. When the new year starts, people begin to budget and plan for summer renovations. Starting the conversation early can mean setting a game plan, and finding out what needs to be replaced. Another reason why you should discuss what needs replacing during the holidays is that you’ll have family keeping their eyes out for blockbuster deals this holiday season. Even though Black Friday and Cyber Monday have passed, Christmas and Boxing Day sales are still yet to come. Discussing what will happen to your old furniture or mattresses can help plan your holiday purchases. It can also minimize your post-shopping regret. If there are sales on a couch and a table, but you have a squeaky couch, then all you need to do is remember to shop for a new couch first since you need it more! 4. Another thing to think about is: what are you going to do with the items you replace? More specifically, what are you going to do with the items you replace? The holidays are nefarious times for strange company schedules and facility closures. Businesses tend to have special holiday hours for servicing customers. The same goes for landfill facilities, transfer stations, and your local recyclers. Even junk removal companies may have special hours that customers have to abide by this holiday season. Knowing how to get rid of your old large items can help minimize stress after you’ve purchased a replacement product. Perhaps you need to store the old item for a few days. 5. During the holidays, we may be short on disposable income. Conversations about what you really need to replace, in terms of furniture and mattresses, is a good budgeting discussion to have. From buying holiday gifts to treating family and friends out to dinners, hosting parties and celebrating the holidays, it’s important to budget to make sure that what needs to be replaced are replaced, and those that can wait can be dealt with in the new year. The last thing you want is feeling regretful that you purchased a new TV when you needed a comfortable bed instead! Or that if you just spent a few dollars less on a gift to a co-worker or family member, you could have afforded that new bed that would’ve helped improved your sleeping. As we are in the throes of the holidays, replacing old furniture and mattresses may be the last thing on our minds. However, the conversation is important to have, especially if you have an exceptionally squeaky couch or a really old mattress that needs replacing soon. It may be a force of habit to postpone the discussion to the new year, but taking advantage of holiday deals may be a plausible alternative. Discussing what will happen in the new year now with your family members can help plan for big purchases. Overall, having these discussions can help reduce stress, help your holiday budget, and minimize any purchases you may regret making! Canadian Mattress Recycling is Metro Vancouver’s only facility that recycles and salvages materials from mattresses and furniture. Since 2011, we have recycled over 21 million lbs of large items and provided employment opportunities for local residents. We believe that recycling goes hand in hand with conserving and protecting the environment, and strive to do just that! Book a pickup today or visit our facility on Annacis Island to drop off your large items for recycling for a fee.